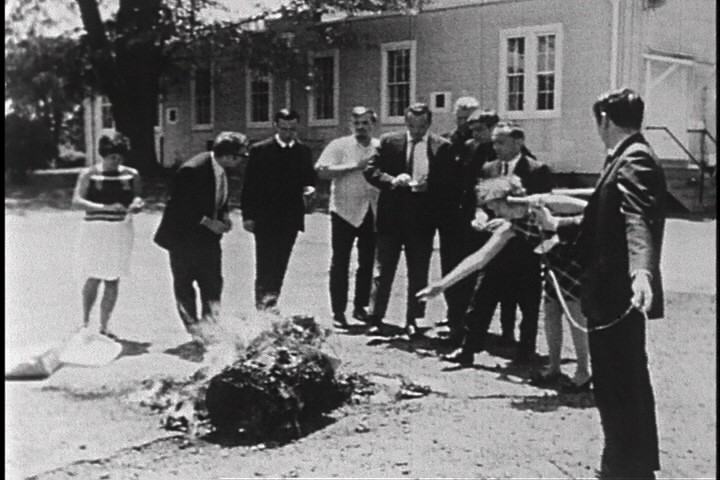 On May 17, 1968 nine Vietnam War protesters led by Daniel and Philip Berrigan, walked into a Catonsville, Maryland draft board office, grabbed hundreds of selective service records and burned them with homemade napalm. “Investigation of a Flame” is an intimate, experimental documentary portrait of the Catonsville Nine, this disparate band of resisters who chose to break the law in a defiant, poetic act of civil disobedience. How did the photos, trial publicity and news of the two year prison sentences help to galvanize a disillusioned American public? “Investigation of a Flame” explores this politically and religiously motivated performance of the 1960’s in the context of extremely different times — times in which critics of Middle East peace agreements, abortion and technology resort to violence of the most random and sanguine kind in order to access the public imagination. Supported with funding from the Maryland Humanities Council, the Maryland State Council on the Arts, the Puffin Foundation and a Media Arts fellowship from the Rockefeller Foundation.